The Snyderman-Works Gallery in Philadelphia -- one of the oldest Studio Craft galleries in the country -- is now celebrating its 50th anniversary with an exhibition of works tracing the art movement the gallery helped establish. The gallery also played a role in Philadelphia's urban revitalization. 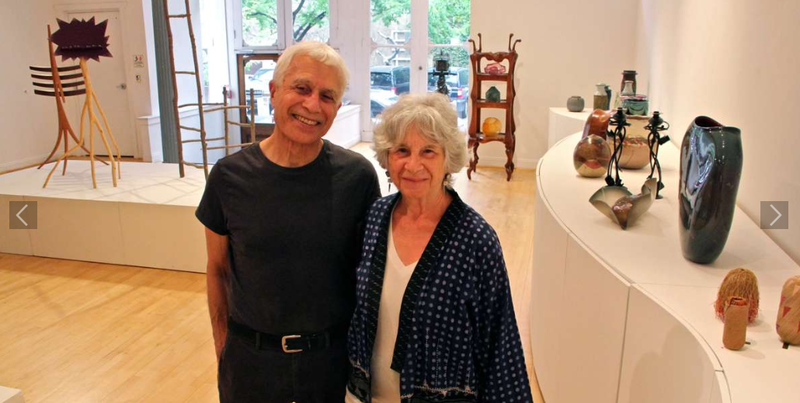 When Ruth Works started The Works gallery in Rittenhouse Square in 1965, she liked ceramics and jewelry made with a highly refined artistry. That kind of work was hard to find, so she and her husband, Rick Snyderman, had to trek into rural areas to visit artists living in handmade houses. "In those days, we had a Volkswagen van, and were going back into the woods to find these people in all these obscure places," said Rick Snyderman. "It was the 1960s. It was the back-to-the-land time." "One time we went with our huskies," recalled Ruth Snyderman of a visit to sculptor Jon Brooks' home in New Hampshire. "There was a terrible snowstorm. We left them outside. They loved to be outside in the snow. No problem. When we came out in the morning, the snow had gone over the fence where their chickens were, and they killed every one. It was not easy to go back there." That friendship was salvaged; the anniversary exhibition has two chairs by Brooks similar to the ones filmmaker Tim Burton used in "Beetlejuice." The dozens of pieces in the show, curated by their son, Evan (co-founder of R Gallery, a design gallery in New York City), all have stories behind them, about the Snydermans' personal relationships with each artist they represented, and about the evolution of the American Studio Craft movement. "This work had integrity," said Rick Snyderman. "Not knowing anything about art, you could look at these objects and get a sense of a person who made these things with a certain amount of love and skill. It was not an intellectual exercise. It was a love of materials." The notion that handmade furniture, blown glass, textiles, and ceramics could be seen as fine art objects was a fresh one at the time, and the Snydermans were at the forefront. "It was the beginning of a movement, which we could not have known," he said. "We did know it was fresh work, that it was different." Other than marrying Ruth, Rick had no art experience, but it grew on him quickly. In the 1960s, he was working for his father's financial services firm while Ruth ran the gallery. "Two artists were staying at our house, and I came down one morning with my briefcase about to dash out the door to my office," remembered Rick. "They were both standing on their heads in a serene yoga pose. I dashed out the door, down the street, and thought, 'One of us has to rethink this. Either they are wrong, or I'm wrong.'" He quit his job in 1972 to focus on the art gallery. By then it had moved to South Street, a neighborhood in decline. They owned a building at 319 South St., with The Works Gallery at street level and their apartment above it. "We would go upstairs and eat dinner, then come down like the old Jewish merchants did," said Ruth. "That's when we did most of our business, between 10 p.m. and midnight. When the customers would come out of restaurants, walk on the street, feeling good from having some drinks. They would come in and buy." Creating a community around art and urban issues has always been a priority for the couple. Ruth was a strong part of the South Street revitalization, coordinating merchants and neighbors to rally against the construction of a crosstown highway through the neighborhood and turn South Street into a retail mecca. In 1992, they moved to Old City when it was a depressed area. Rick helped create the First Friday art crawl, which was instrumental in turning that neighborhood around. "If we were younger, we would go to Fishtown," said Ruth. "It's almost too late for Fishtown." "If I was 25 years younger, I would," said Rick. "Having adventures is what makes life interesting ... I don't like the idea of being an established icon. That's not interesting. It might be by default, and I have no choice. But in my head, I'm back on South Street." Rick Snyderman, now 78, is ready for his next career change. He said he will reduce the gallery business to make room for an art consulting business he plans to launch soon.